Room begins by making a small space seem both visually huge and theoretically tiny. This small room acts as the world to 5 year old Jack and his mother, who he calls Ma. Beyond the walls there is "nothing but outer space". Everything they see on TV is "fake", and from "another planet". It is never referred to as "the room", simply "Room". This is all Jack knows, he was born in Room and has lived all five of his years there. As a set up for a film (and a novel, as this is based on a novel) this is undeniably intriguing. Simultaneously, it's almost impossible to write a review on without discussing the narrative, so if you're yet to see Room I'd recommend skipping this review until you have. Because Room is a sensational experience: it is both big and small, it is packed with emotion and powerhouse performances and an exceptionally intricate script. But the one thing that I know most of all about Room, is that you do not want it spoiled for you. Seriously, even avoid the trailers. Go in entirely blank, and you'll be rewarded with one of the most captivating films in recent memory. 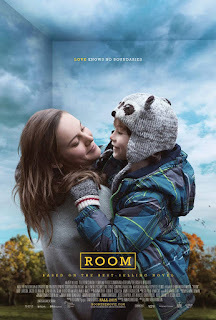 As just mentioned, Room is about a mother (Brie Larson) and son (Jacob Tremblay) who live in one confined room, and have lived there for seven years. Joy, the mother, was abducted at seventeen years old and subsequently raped, leading her to falling pregnant with Jack who has now lived his whole life in Room. However, shortly after Jack's fifth birthday, Joy hatches a plan for the two of them to escape and rejoin the outside world, a world which Jack doesn't believe exists. The plan works, and they are reunited in the world shortly after, but they soon find that this world isn't as kind to them as they hoped, and both have extreme difficulties in adapting to their new lives. It's a truly fascinating concept, even just thinking about the idea of having never seen grass before or having never walked down a flight of stairs is enough to get the mind going, but Room focuses instead more on the emotional impact this ordeal has on Joy and Jack, and it's all the better for it. Smartly, Room doesn't have Jack and Joy break out until just under half way through the film. This begins about thirty minutes in with Joy informing Jack of the outside world, followed by him slowly accepting its existence, then one failed escape plan, and finally the successful one in which Jack ends up with the Police. We then have to wait even longer to be shown that Joy is rescued too. The whole sequence - which lasts a good 20 minutes, remember - is almost incomprehensibly intense: I could feel my heart pounding the entire time, and to the extent that when the film stopped to collect itself in the following sequence in the hospital I had a headache. It's a testament to the excellence of this film's scripting and performances that a sequence at the midpoint of the story can have this effect. Emma Donoghue's script, adapted from her own novel, defines Jack and his Ma fantastically within the confines of Room. Much like they do, we have to get to know them again once they've escaped. Jack's brief and beautifully written bursts of narration give a powerful insight into how he sees this new world, while simple touches like his hesitation at the top of a staircase do wonders to strengthen how alien his new life is to him. Room's script is excellent, don't get me wrong, but the film's real power comes from its performances. Larson, the hot favourite for this year's Best Actress Oscar, offers tremendous range across her performance: she fluctuates seamlessly from calm and collected, to aggressive and controlling, to broken and emotional. She is given an enormous amount of material to work with, and she portrays Joy's inner turmoil with seriously impressive determination. It's a simply outstanding performance. Matching her is the seven year old Tremblay - yes, you read that correctly, he was seven - who handles his complicated material as if he's been on the big screen for decades. Watching his social skills and mental state improve as he adapts to the outside world is a genuinely emotional journey for the viewer to undertake, and this comes down solely to Tremblay's committed and powerful performance: it is quite simply stunning, and his lack of a Supporting Actor nomination at this year's Oscars is unjustifiable. Combining performances of this calibre to a script as strong as Donoghue's is a sure fire road to success, but even I didn't predict the sheer power of Room. There are countless moments in Room that stir an emotional reaction, most noticeably the larger moments like Jack and Ma's escape from Room or Joy's suicide attempt in the middle act - just look at Tremblay's facial expression as Jack walks in on his mother dying, it is heartbreaking. But there are also a handful of softer and more quiet moments that perhaps aren't getting the recognition they deserve: Jack meeting and bonding with his Grandma's dog was a touching moment, as was Jack's offer to send his newly cut hair to his hospitalized mother (his hair is "where his strong is"), followed by him telling his Grandma that he loves her for the first time. Hell, even the lone shot of Jack and Ma swinging softly on a hammock is a lump-in-your-throat moment given the context it's given prior to it. But the final scene, in which mother and son return to Room for a visit, is perhaps the film's most powerful moment. Suddenly, Room is framed to seem tiny. The walls are bare, the household essentials have been removed. All of a sudden, this looks like the prison it actually was. Jack remarks that "it looks like someone shrinked it", and the fantastically tight framing justifies his confusion. Jack and Ma, now emotionally detached from Room and ready to move on with their new lives, bid farewell to Room and walk away. A rough estimate puts around six months between Jack and Ma's escape from Room and their final detachment from it. It took them six months to free themselves from Room, and, I'm telling you, it could take me even longer than that to fully free myself of the emotional weight this film offers. To Summarise: With a compelling story and a powerfully emotional script to guide it through its weighty subject matter, Room is a rewarding, captivating and deeply moving film that brings out the absolute best in both Brie Larson and Jacob Tremblay.